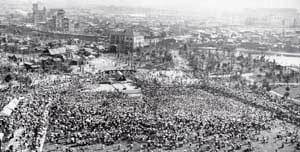 A young girl died in the fall of 1955.
and Hiroshima City was bustling again. However, behind the cheer of recovery lay scars from the bombing that were still raw. The US and the USSR were engaged in an arms race and repeatedly conducting nuclear tests; higher than natural radiation levels were detected in Japanese rain. people could not forget about nuclear weapons. Sadako Sasaki was born in 1943 and experienced the bombing at age two. She was healthy and athletically gifted growing up, but ten years after the bombing, she was suddenly hospitalized. and she received some of them as a get-well gift. This inspired her to begin folding her own thinking, "I want to live." After eight months in the hospital, she died surrounded by her family. Sadako's parents hoped she would grow up healthy. Sadako Sasaki was born to the Sasaki family on January 7, 1943. The family owned a barbershop, and she was the first daughter. Japan was at war at the time, and soon after her birth her father was drafted into the army. Her mother managed the barbershop. 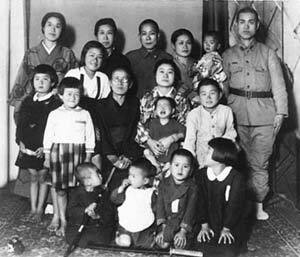 In the photo, Sadako's mother is seated in the center holding Sadako. 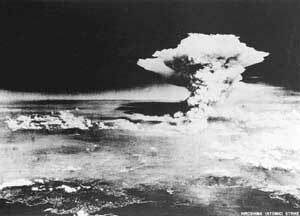 On August 6, 1945, an atomic bomb was dropped on Hiroshima. Sadako was exposed at home with her family in Kusunoki-cho, about 1.7 km from the hypocenter. The blast blew her out of the house, but she escaped without a burn or injury. Very soon, flames were leaping up in the area. Sadako's mother fled, carrying her daughter. Near Misasa Bridge, they were caught in the "black rain." Because Sadako's home had burned down, the family took shelter in a relative's home in Miyoshi in the northern part of the prefecture. The heat rays and fires had burnt up everything consumable within a two-kilometer radius of the hypocenter. The atomic bomb's blast, heat ray, and radiation were devastating. Of the roughly 350,000 people who were in the city at the time, 140,000 +-10,000 had perished by the end of December because of that single bomb. Sadako in the 6th grade. At 135 centimeters tall and weighing 27 kilograms, she was a little thin, but quite vigorous. She could run 50 meters in 7.5 seconds, so she never lost a race. Chosen to be one of the relay race runners for Fall Sports Day, she turned in a fine performance. 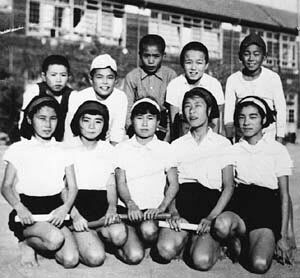 Her dream was to become a physical education teacher in junior high school. It was noticed around September that she looked a little pale, but nobody was particularly worried. Sadako is in the center of the front row. Everyone thought it was a cold at first, but Sadako was sent to a hospital for more precise testing. The diagnosis was leukemia. On February 18, a doctor told Mr. Sasaki, "She has a year at the most. She must be hospitalized at once." He did not want to believe that his daughter had such a grave disease. He explained to Sadako, "You've got to go into the hospital for a little while until those lumps go away." 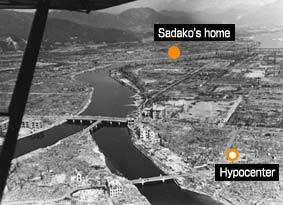 On February 21, Sadako entered the Hiroshima Red Cross Hospital. When Sadako's classmates at elementary school heard from their teacher that Sadako had been hospitalized, they took turns visiting her. When graduation came, her father received her diploma for her. About one month after entering the hospital, Sadako was enrolled in the same junior high school as her classmates, but she was never to attend. 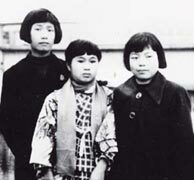 On August 6, Sadako received permission to leave the hospital to attend the Peace Memorial Ceremony with her family. On the way to the park, however, Sadako bled from the gums and felt ill. She had to return to the hospital right away, without attending the ceremony. Sadako stringed thread through lines of cranes that she folded and hung them from the ceiling of her room in the hospital. By the end of August---less than a month after she started—Sadako had 1,000 paper cranes, but she continued to fold. Toward the end of September, Sadako's white blood cells began to increase for the third time since being hospitalized. Her condition gradually deteriorated until she could no longer walk unassisted. On the morning of October 25, surrounded by her family, Sadako passed away.